What is the Toyota Prius known for? Hybrid efficiency. It’s such an important factor that we included it in the title twice. 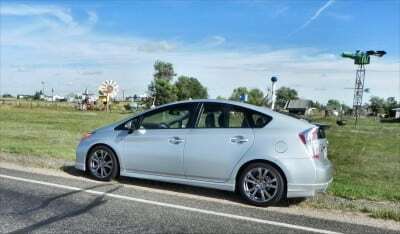 A test drive of the 2014 Toyota Prius in its top-end Five trim level proved that efficiency is what it’s all about with this car. It’s been about fifteen years since the Toyota Prius was introduced in the U.S. and it’s still the most popular hybrid on the market. 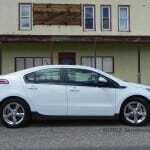 In fact, all other hybrid vehicles combined still don’t sell as well as does the Prius. 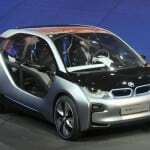 For the 2014 model year, the Toyota Prius in its top fitting, the Five model, changes little from the previous year, adding only a few small improvements to technology offerings. To be fair, little needed changing. The Toyota Prius is all about hybrid efficiency in a versatile enough package that it can be used every day without compromise. The 2014 Prius hits that on the head squarely. As a daily driver, what it lacks in sports finesse it makes up for in usefulness. Hey, that rhymed! 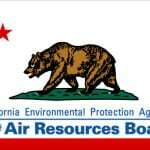 The 2014 Toyota Prius is powered by a 1.8-liter four-cylinder Atkins-style engine and two electric motor-generators. 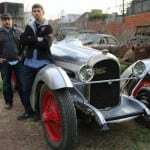 It is front-wheel driven and puts out a total of 134 horsepower to a continuously variable transmission (CVT). In hybrids, that CVT shines in Toyota’s models whereas it’s a bit clunky in standard gasoline cars (see our Corolla review here). All of the above jargon translates to a phenomenal 51 mpg in the city, 48 mpg on the highway for an EPA combined rating of 50 mpg. In our driving, which was mostly highway and freeway driving with crosswinds, high altitudes, and then peppered with town and city driving, we saw 46 mpg on average. 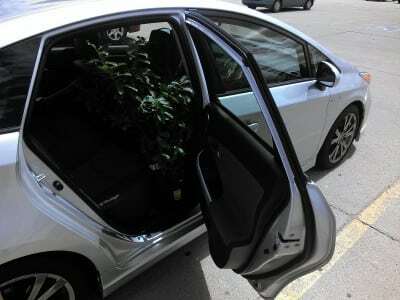 The car had two to four passengers and a lot of stuff in it, so it was loaded for most of that driving. 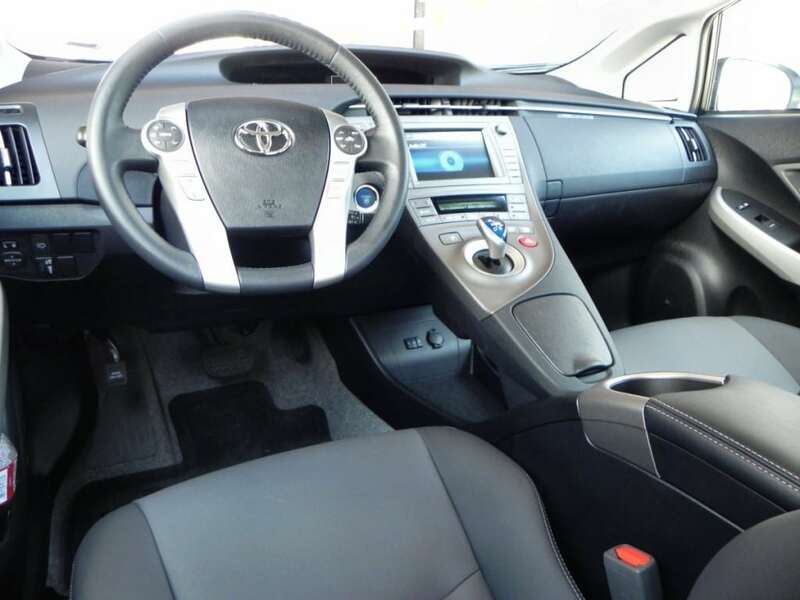 Inside, the 2014 Toyota Prius Five is a no-nonsense, straight forward vehicle with little in the way of “wow” factor for electronics or design. Those new to the Prius will note that the traditional instrument cluster is gone and has been replaced with a centralized multi-function screen on the upper dash that allows both driver and passenger to have access to the ongoing information thereon. This takes a little getting used to, but becomes obvious once the hybrid-centric, fuel-efficient driving focus of the car is considered. Shifting is also a bit odd for the first-timer. A small handle chooses gear options (Drive, Reverse, Neutral, and Battery, shown above). 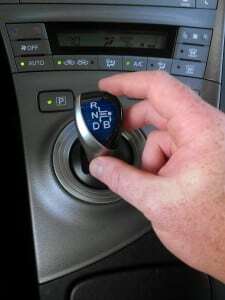 The Battery mode aggressively regenerates power for the battery by acting as an engine brake when your foot lets off the accelerator. Great for off-ramps and in-city driving with stop-and-go. Seating is comfortable, but not cushy or memorable. The rear seat has plenty of room for most adults and easy accommodates child safety seats. It is a split-fold and all seats except the driver’s seat fold flat, allowing for a lot of versatility in configuration for carrying various loads. 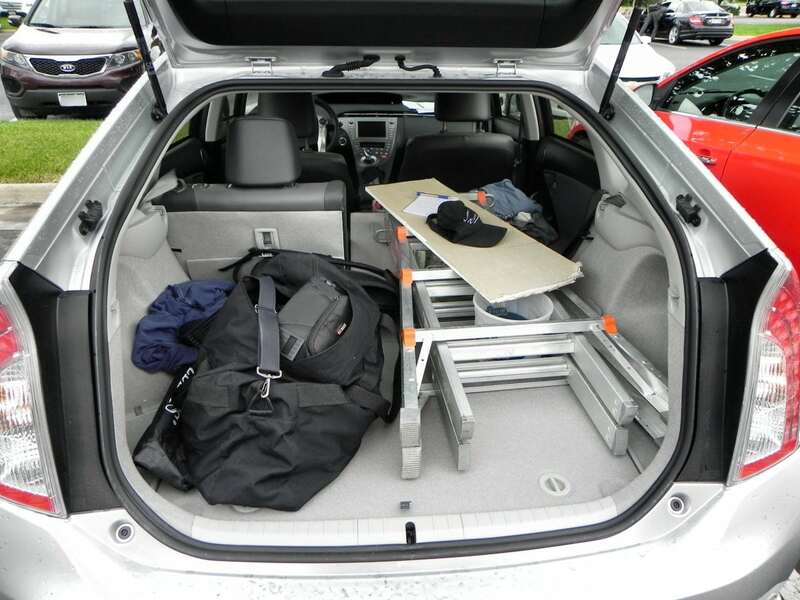 At one point during my test drive, a friend and I loaded a ladder, some tools, and other miscellaneous goods into the car to do some home improvements and had little trouble finding room to get it all in given the seat folding options. 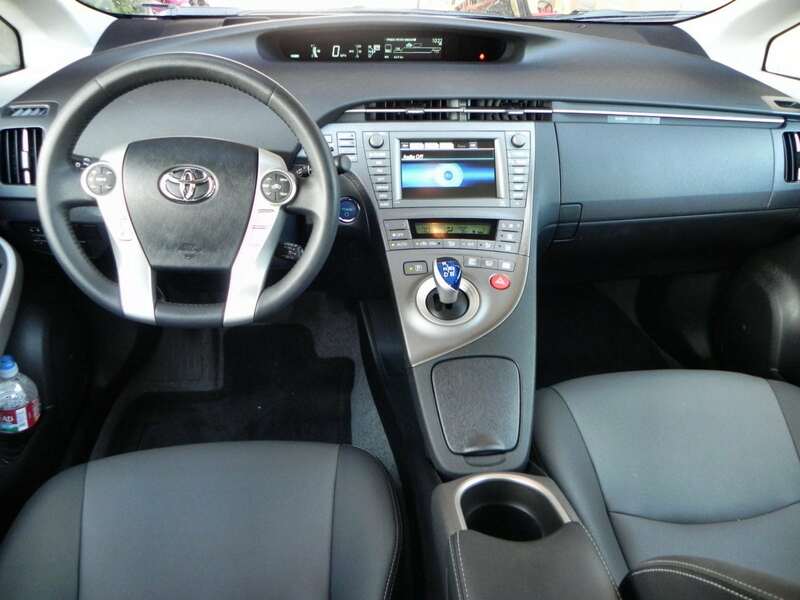 It should be noted that the hard plastics and somewhat cheap-appearing materials that adorn the interior of the Prius, even at this top fitting, might be disappointing to many buying in this price range. They also mean that the cabin is loud on the highway with a lot of reverb and occasional clatter. The Prius Five, as we drove it, is the top most trim level for the Toyota Prius lineup in the Liftback model. Don’t confuse the Prius Five with the Prius V, which is a larger, station wagon version of the Prius. The Prius Two is the base model here and features 15-inch alloy wheels and basic accouterments. The Three adds a keyless entry system, rearview camera, navigation, satellite radio, and some other technology. The Four nets automatic headlights, eight-way seat adjustment for the driver, heated front seats, and better leatherette upholstery. The Five upgrades that with 17-inch alloy wheels, fog lamps and LED lighting. Our test model also included the optional Advanced Technology and Plus Performance packages. These add more tech and higher-end wheels and some chassis tightening respectively. The Toyota Prius has never been known as a sporty car and that holds true in the 2014 model year. The 2014 Prius Five is slow and nearly dead to the driver. In this car, though, it’s all about fuel economy and that slow uptake and sedate drive returns real fuel sipping performance. In traffic and around town, the Toyota Prius is easy to maneuver and has good visibility for the driver. It’s not the smoothest car on the highway, but it does well enough for most. 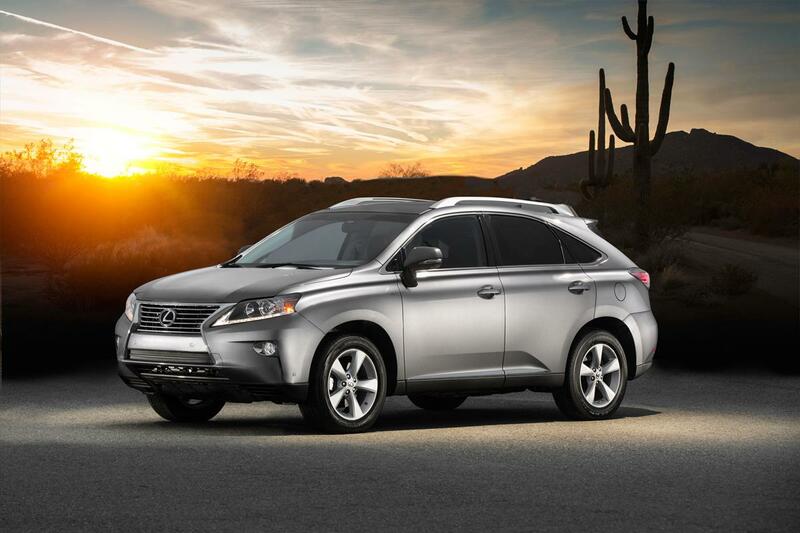 The compact hybrid market is an on-again, off-again scene with competition coming and going. Recent serious competitors to the Prius Liftback include the Ford C-Max Hybrid, which also comes in a plug-in variant and the sedan-styled Honda Accord Hybrid. Your choice between these will largely depend on what you want out of the car in terms of efficiency, style, and versatility. The C-Max is a good matchup against the Prius, but isn’t selling at the volume the Toyota hybrid does. Honda has discontinued the Insight hybrid. Extremely fuel efficient for both city and highway driving, even under load. Very versatile with plenty of room for a lot more than might be expected. No one would seriously call the Toyota Prius “sporty,” “fun,” or “luxurious.” Not with a straight face. Everyone would call it the height of efficiency in an extremely versatile package, however, and they would do so without hesitation. The 2014 Toyota Prius Five is a nicely-done combination of economy, versatility, and technology. 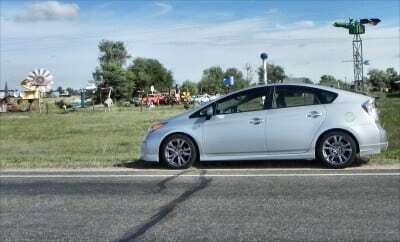 The Prius Five was a manufacturer’s press loan for about a week during which time over 400 miles were put on the vehicle, mostly highway, freeway and some city traffic. Is the Mitsubishi Evo dead?